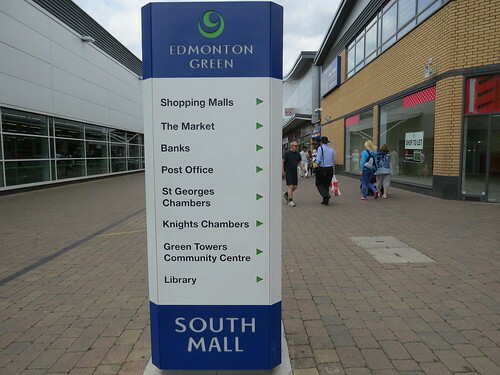 N9 is Lower Edmonton, according to the Post Office, although the station and the area around it have been rebranded Edmonton Green, presumably to remove the negative connotations of the word “Lower”. 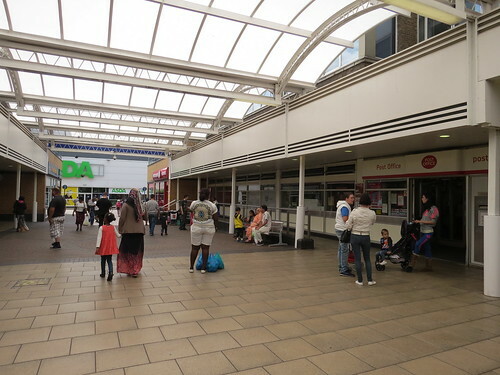 We start at the Post Office in Edmonton Green shopping centre. Turn left out of the Post Office (away from Asda) and walk down the South Mall to the Market Square. 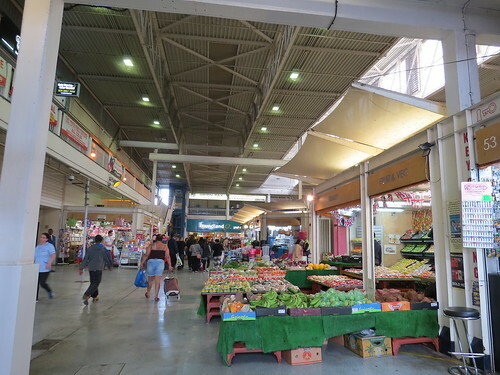 This is a rather unusual shopping centre in that it does not have many national retailers and those that are here are at the cheaper end of the market. But the Mall itself, although basically an industrial shed, is bright and clean with few empty shops and it is not at all run down. 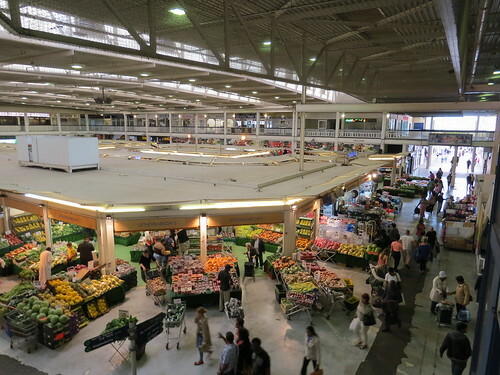 The centrepiece is the Market Square, with some very impressive displays of fruit and veg. Exit the Square by the North Mall, following this through to the end. When you exit go left and ahead you will see our next stop. This is rather a surprise a terrace of twenty five Georgian houses, fenced off from the road with grass in front of them. They were built over a period between 1826 and 1851 as an unsuccessful speculation. Note the terrace is not symmetrical. It is lop sided with more houses on one side of the central pediment than the other. Now return and go down Monmouth Road, noting the sign for New Road a street which has all but disappeared under the new development. We will come back to this name later. Take the first right (St Martins Road which becomes Plevna Road). This takes you behind the modern shopping centre. Interesting name Plevna. It is a place in modern day Bulgaria. But I discover the Siege of Plevna was a major battle in a war fought in 1877/78 by the joint army of Russia and Romania against the Ottoman Empire. The Ottoman defence delayed the main Russian advance southwards into Bulgaria for five months, encouraging others to support the Ottoman cause and enabling the Empire to carry on for a few more years. Wikipedia says that there are 18 streets in Britain with the name Plevna which is fascinating given it was not one of “our” wars, at least I do not think it was. Continue along Plevna Road until you reach the end of the shopping centre. On your left you will see a stream and then immediately after a pathway curving off. 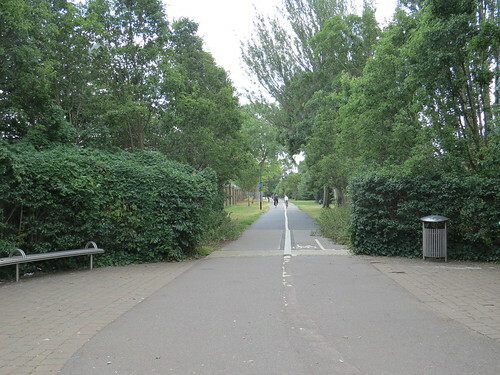 This pedestrian and cycle way is actually following an old railway track. The first railway in the Lea Valley was further east starting in Stratford and heading up through Ponder’s End to Broxbourne. 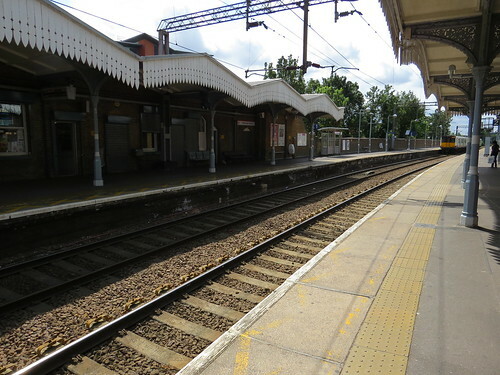 This opened in 1840 but in 1849 a single track branch was opened to Enfield, stopping at Lower Edmonton. 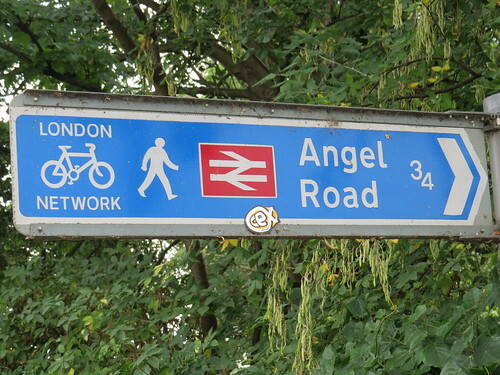 This left the main line at the present day Angel Road station which at the time of opening was called Edmonton. This original Edmonton station was renamed Water Lane and the new intermediate station on the branch was named Edmonton. The original route declined as a consequence of the more direct route and eventually it shut to passengers in 1939 although the line continued to be used for goods trains. It finally closed completely in 1964. Edmonton Green Shopping Centre now sits on the former site of the platforms but for quite a distance south of here it is possible to follow the line of old track using this path. Now according to the wonderful Cinema treasures website (http://cinematreasures.org/theaters/22837), the Edmonton Empire stood at 10 New Road. This is the other end of New Road to what we saw earlier. But this end has, I think, completely disappeared under the new Leisure Centre and the Asda car park. A picture on the site shows the building with a railway line at an angle behind it. And my early 1970s A-Z shows the Town Hall at the corner of Plevna Road and then just north is the cinema. I think this suggests it was somewhere around what is now the Asda car park, or just northwards. But there is nothing to see (apart apparently from some fragments of a wall – which I could not find). Well this building has two claims to fame. First there was a Music Hall built in 1908 called the Empire and this was where the famous Music hall star Marie Lloyd made her last performance. She was taken ill here and died shortly afterwards in 1922. Second this was the first theatre leased by Sidney Bernstein who went on to found the Granada cinema chain. And it was rebuilt in 1933 as a rather extravagant cinema. It was actually owned by Gaumont and was not named as the Granada until 1950. Granada only finally bought the cinema in 1965. But it closed in 1968 and after one year as a bingo hall, it was demolished in 1970. Cross over and continue until you reach the end of the green by the corner of Bridge Road. 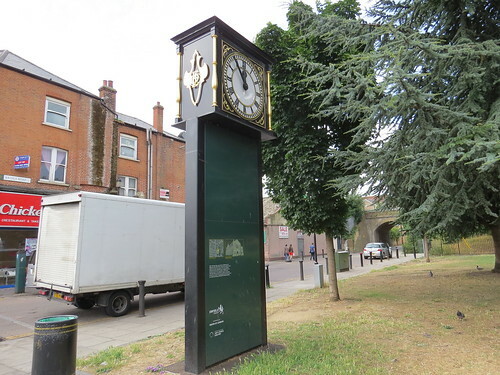 This clock does look odd standing here on its own. This was originally on the now demolished Town Hall which stood over the road. “The Edmonton Town Hall Clock dates from 1903 and was originally part of Edmonton Town Hall (built in 1884 and extended in 1903) which stood on the site of the Asda supermarket. The clock originally hung from the Town Hall frontage on Knights Lane but was later moved to Fore Street. The Town Hall was demolished in 1989 but, fortunately, the clock was saved. It was restored and erected on the Green in 2012 and officially unveiled in March 2013 to commemorate Queen Elizabeth II’s Diamond Jubilee. The Town Hall would have been built by Edmonton Local Board which ran local affairs from 1850 to 1894 when the area became an Urban district. In 1937 the urban district gained municipal borough status. By then much of Edmonton, although not the bit we are visiting, was synonymous with light industry and so the council took the motto “Faith in Industry”. Maybe it was fitting then, but you cannot help feeling that successive governments have not had much faith in industry in more recent years. Continue walking along the grassed area and at the other end you will get to what is today called Edmonton Green station. The station we see today is the old “high level” station. 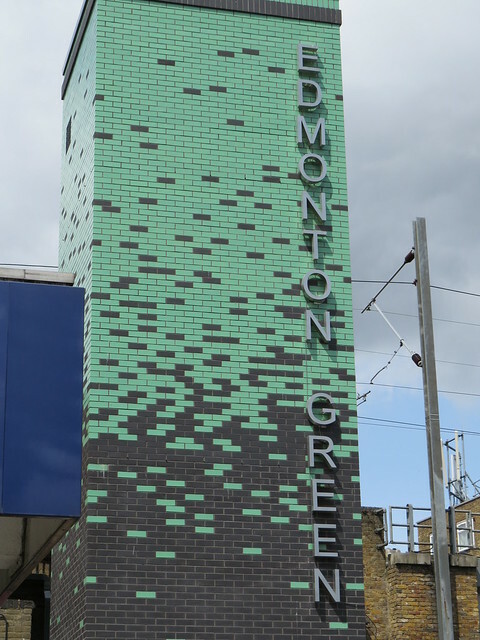 Originally called Lower Edmonton it is today known as Edmonton Green station. Curiously in the subway in the station, there is this panel. 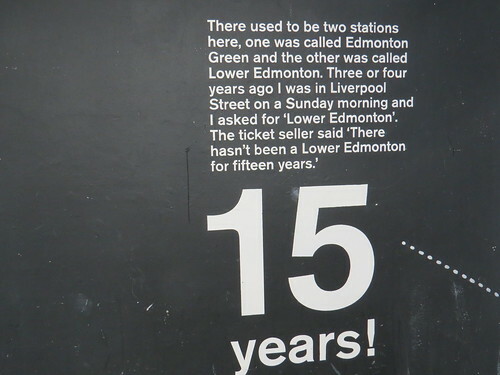 This is actually wrong in that it was Lower Edmonton station that was renamed Edmonton Green. There were not two different stations – one with each name. Now come out of the station and turn left and go under the railway bridge. Our next stop is just on the right. 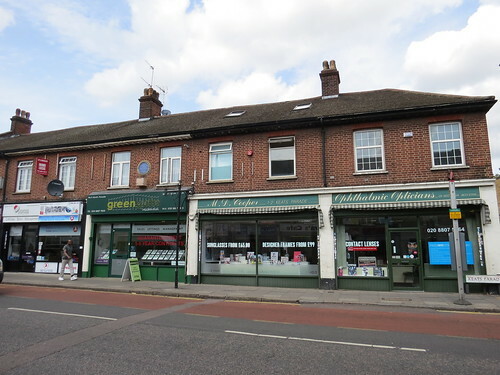 This dull looking group of shops is called Keats Parade in honour of the fact that John Keats (1795 – 1821) briefly lived in a house on this site. The poet, was apprenticed to surgeon Dr Thomas Hammond in his house here Church Street in 1811. He lodged in the attic above the surgery. The house was demolished in 1931 to be replaced by Keats Parade. There is a plaque in commemoration. 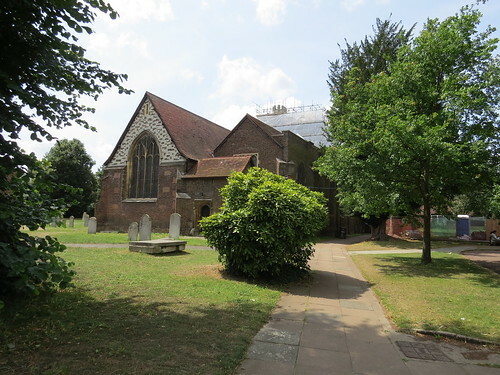 Our next stop is on the opposite side of the road from Keats Parade and opposite the end of Lion Road, on the south side of Church Street. 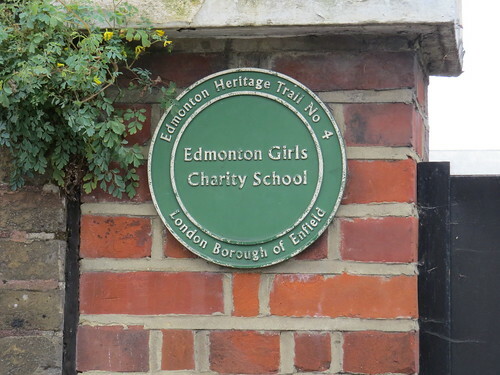 The simple yellow and red brick building was the Edmonton Girl’s Charity school. It had been founded in 1784 on a different site. It was moved here because a man called Obadiah Legrew, grew tired of the children close to his home. He had the original school demolished, drew £170 from the trust, and purchased another plot of land. 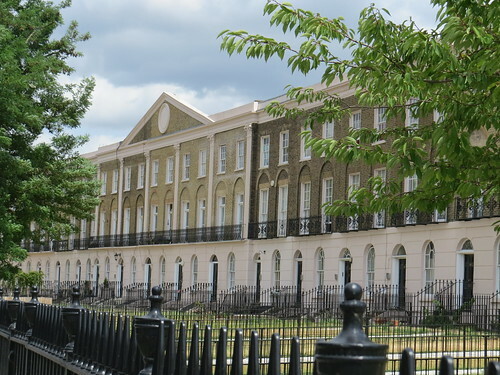 The new school was built in 1793 to educate pupils aged between 7 and 14 with the main purpose to fit them for domestic service. The school closed in 1904. Now continue walking along Church Street. Our next stop is on the other side of the road. This was once known as Bay Cottage and is believed to have been built in the 1680s. Writers Charles Lamb (1775 – 1834) and Mary Lamb (1764 – 1847) lived in this house in 1833–34, and it is where Charles Lamb died. And there is a blue plaque on the cottage which can just about see from the road. 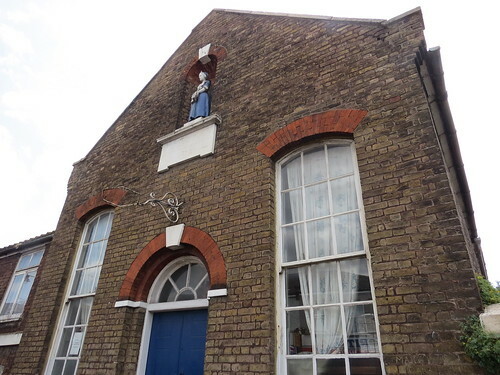 This is only one of two English Heritage blue plaques in N9 so far as I can determine. “… best known for his Essays of Elia and for the children’s book Tales from Shakespeare, which he produced with his sister, Mary Lamb . This has a quote from each man. The Keats one is “Beauty is truth, truth beauty”. The connections between Edmonton and these two men is not that great really but Edmonton certainly seems to have made the most of it. Keep walking. Our next stop is over the road. You cannot really miss it. The mostly 15th century church is the oldest building in Edmonton, although it has substantially rebuilt and extended over the centuries. 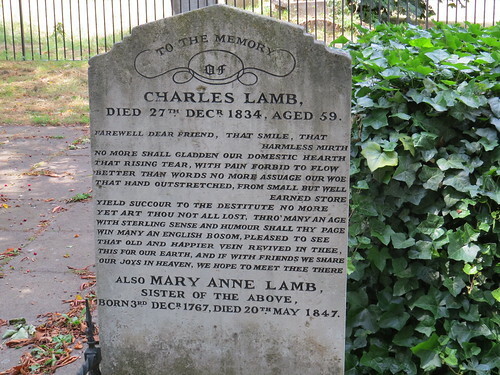 Charles and Mary Lamb are buried in the churchyard. 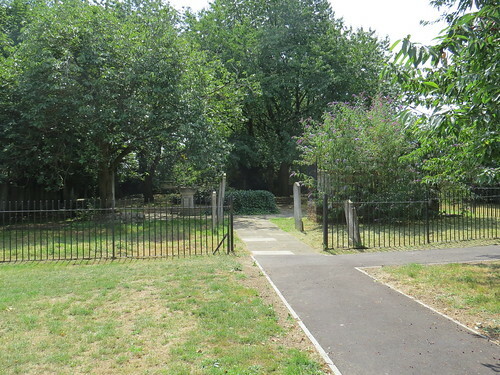 If you head to the other side of the church building you will see a fenced off area in the churchyard and this is where the Lamb gravestone is. 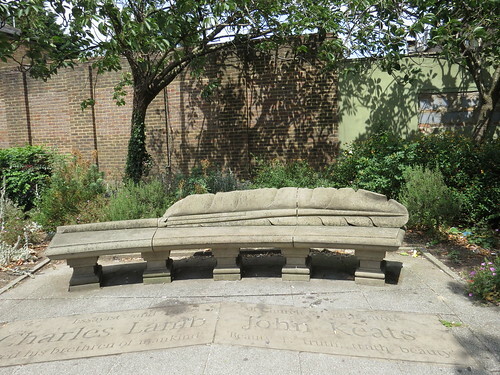 Apparently there is also a memorial to Charles Lamb (and to the poet William Cowper) inside the church, but it was closed so I did not get a chance to see them. 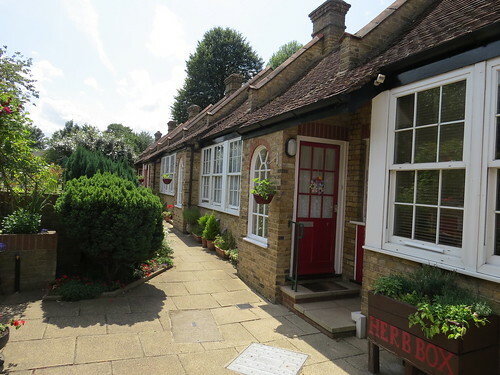 Just next to the church are some lovely little Almshouses. The orignal almshouses were built in 1679. And there are various signs to show how they were rebuilt in 1754, demolished and rebuilt in 1903, improved and modernised in 1960 and again in 1991. Now cross the road for our next stop. This rather fine stone Grade II listed building was opened in 1908, more than 70 years after Lamb’s death. This was in effect a rather grand church hall, built for All Saints Church across the road, although it seems to have had other community functions. This says that Tony Hunt worked for English Heritage until he retired in 1999. 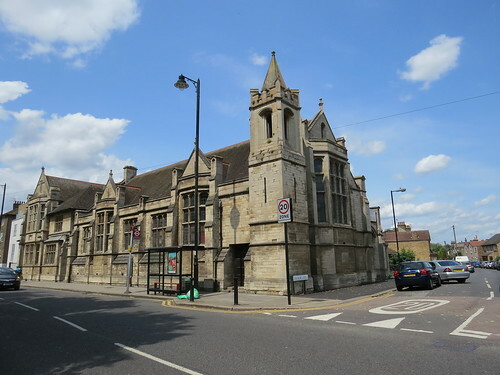 And he has the Architectural Association’s Graduate Diploma in Building Conservation for which his dissertation was on the work of J S Alder – Alder was the architect of this building. This pamphlet explains that by associating the project with the name Charles Lamb the promoters were able to get funding from not just Church of England supporters. However Charles Lamb appears to have had no particular association with the Church in general or Edmonton Parish Church in particular. In religion he tended towards Unitarianism. He lived in Edmonton for less than two years yet, but because his cottage had survived and his grave was there, Edmonton became something of a focus for Lamb enthusiasts. The building was sold by the parish in 1982 and was a gym until 2009 when the building was taken on by the New Covenant Church. However from the outside it looked rather unoccupied to me. 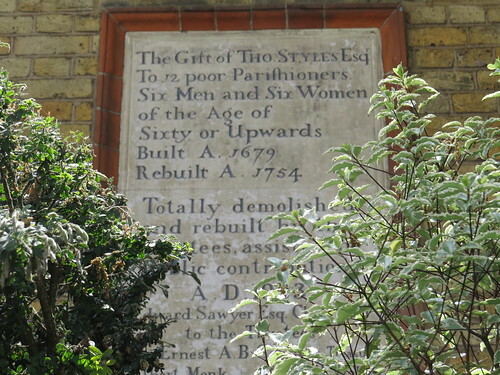 My eye though was drawn to the foundation stone at the Tower corner by Church Lane. 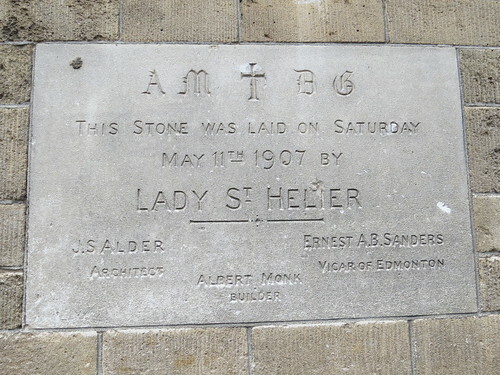 This was laid by Lady St Helier in May 1907. 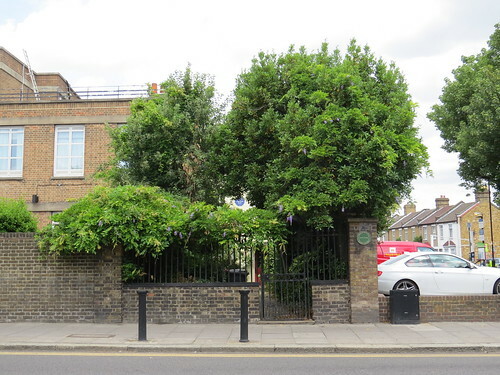 Lady St Helier (1845 – 1931) is the person after whom the St Helier housing estate in south London is named. She was Lady St Helier by virtue of her second marriage to Francis Jeune, later the 1st (and only) Baron St Helier. She had had two daughters by her first husband but her only son by Lord St Helier died in 1904 and so there was no male heir to inherit the title. Thus there was only one Baron St Helier and only one Lady St Helier. She was by all accounts an indefatigable London hostess and friend of many of the celebrities of her day. In 1910, she became an Alderman on the London County Council, holding office until 1927 and she was a great supporter of improving housing for ordinary folks. As the St Helier estate was built between 1928 and 1936 by the London County Council, sadly she did not live to see it finished. 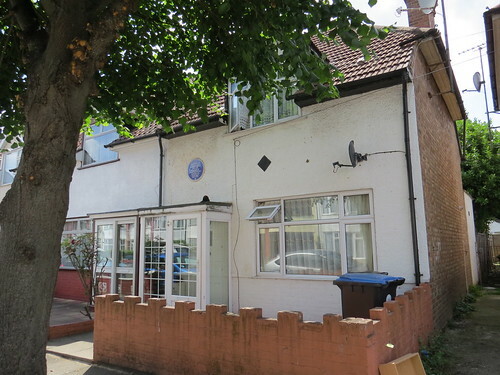 Now I mentioned there were two English Heritage blue plaques in N9. I wanted to include the other one but it is a little out of our way. So if you want to finish here just return down Church Street and you will soon be at Edmonton Green with its station and bus station. But if you want to see this second plaque, turn down Winchester Road and then right into Durham Road and left into Chichester Road. A way down this quite unassuming street after Glastonbury Road, you will find number 133 on the left. From 1945 until 1976, this was the home of a man called Charles Clarke (1905-1976) who was known for being a rescuer of Prisoners from Auschwitz. 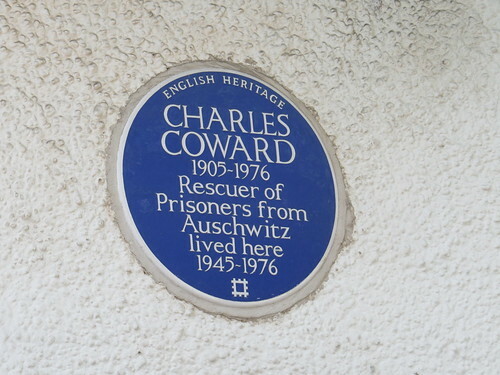 According to a local newspaper report dated 21 July 2009 (http://www.enfieldindependent.co.uk/news/4504150.Edmonton_soldier_Charles_Coward_may_finally_be_recognised_by_British_Government/) he was nicknamed the Count of Auschwitz for rescuing 400 Jews from the Nazi concentration camp. He was a sergeant major in the British army and used his position as a Red Cross liaison officer in charge of escorting Jews to the gas chambers to bribe guards with food and smuggle healthy prisoners out. He also sent coded messages back to the British authorities detailing the numbers of Jews arriving at the camps and the moves of the German military, and was a prosecution witness at the Nuremberg Trials. And this was the modest house he settled in after the war. The blue plaque was put up in 2003 according to the English heritage site. So that brings us to the end of our N9 walk. 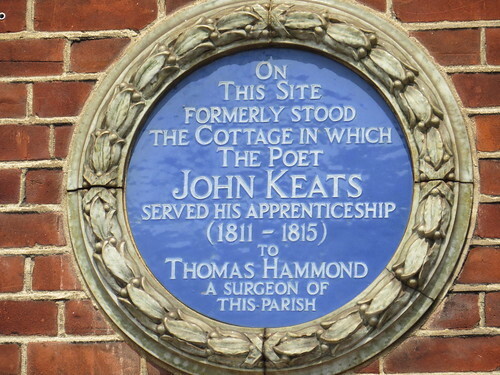 We have seen much about the Keats and Lamb connections but there are some other interesting connections I have not managed to follow up. I have not tracked down the childhood home of entertainer Bruce Forsyth. His family owned a car repair garage in Victoria Road, apparently. Nor have I made the connection with Edmonton in Canada which is indeed named after this Edmonton. Edmonton was the home town of Sir James Winter Lake, director of the Hudson’s Bay Company and of John Peter Pruden, who was a company employee and who was said to have suggested the name of the trading post Fort Edmonton which later developed as a city. For onward travel, either return to Church Street and then Edmonton Green. Or else you can keep walking to the end of Chichester Road where you will see Bury Street ahead of you going over the railway. You can flag down a Route 192 here to go back to Edmonton (that is over the railway) or on the other way to Enfield. This is a hail and ride section of the route, so there are no set bus stops.